I started the front of the vest last night. I did about four rows. As you can see, I had to make some of my own bobbins out of a recycled cracker box. I didn't really want to go buy any more. So far, they're working just fine. Everything does tend to get jumbled together pretty easily. 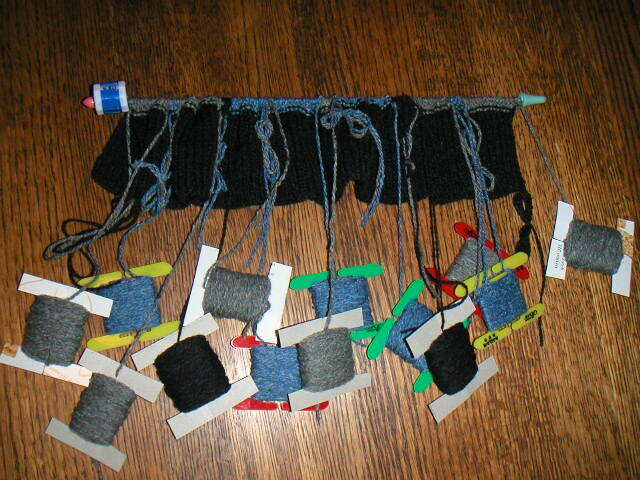 It's hard to get a knitting rhythm going when I have to stop every few stitches to find the correct bobbin I need. I'm glad I started though, because now I'm more inclined to finish the project, tangles and all.